The Steel Framing Industry Association publishes case studies to provide builders and architects with real-world examples of how CFS has been essential to the success of a building project. Luxury for Less. 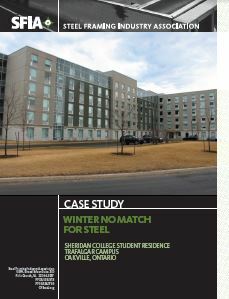 Cold-formed steel saves $250,000 in building a modern mid-rise building. Modern Erector Set. 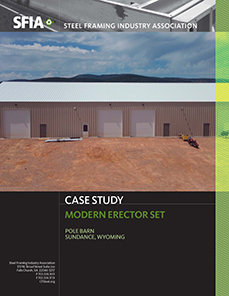 Design and production technology enables untrained laborers to build a pole barn in less time and at a lower cost than traditional materials. Money in the Bank Credit Union’s switch from wood to noncombustible cold-formed steel trusses saves $40,000. 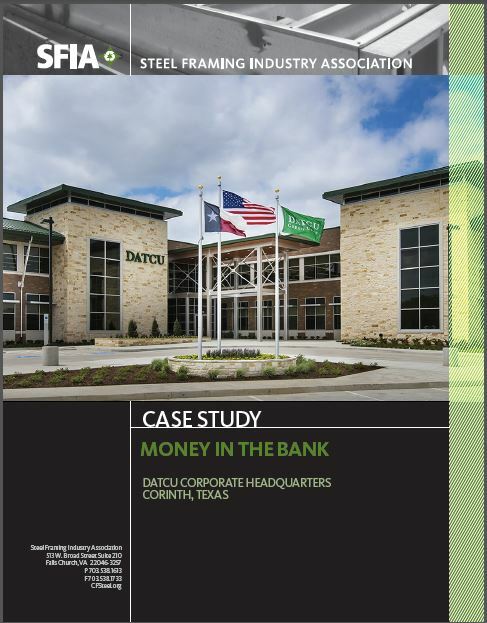 Pre-fabricated components cuts weeks off delivery times, and the precision of cold-formed steel makes installation at the DATCU Headquarters was simple and quick. 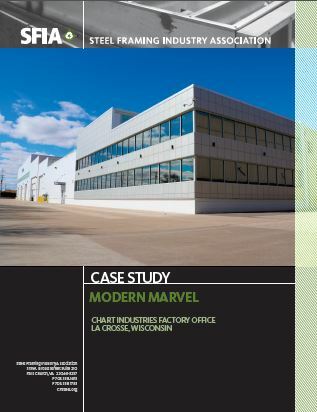 Chart Industries Factory Office Cold-formed steel framing proves to be the perfect wall system for manufacturing plant expansion, giving the architect the freedom needed for a light, open design and saving the owner $2.50 per sq. ft. versus masonry construction. Sheridan College Student Residence: The Trafalgar campus of Sheridan College's new student residence features load-bearing cold-formed steel installed on concrete foundations poured before winter began. 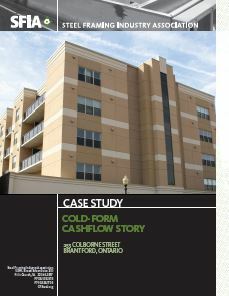 Colborne Street: Cold-formed steel cuts weeks off the construction schedule at 255 Colborne Street, Brentford, Ontario. 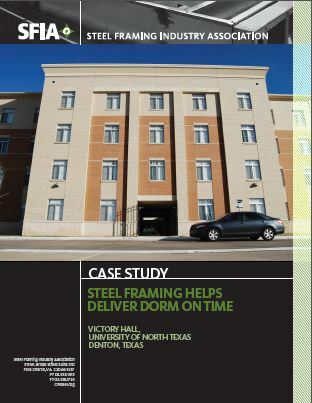 Victory Hall: The University of North Texas’s Victory Hall used load-bearing cold-formed steel framing to shave 25% off the construction times. 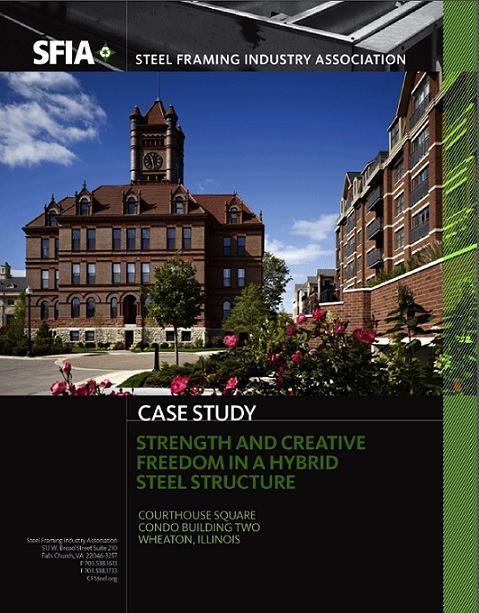 City Green: City Green shows how the light weight and strength of CFS provider the architectural freedom, enabled the builder to use less material, and shortened the time of construction. Convent Hill: "Convent Hill” describes how the strength and sustainability of CFS were combined to enable the architect to achieve design and “green” project objectives. 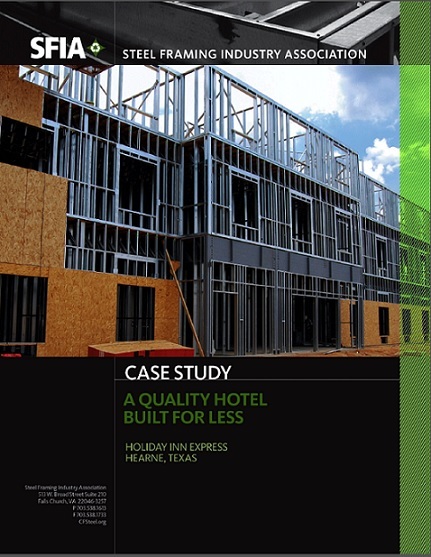 Holiday Inn Express: Hearne Hospitality finds construction savings, lower insurance premiums and less maintenance from cold-formed steel systems versus wood. 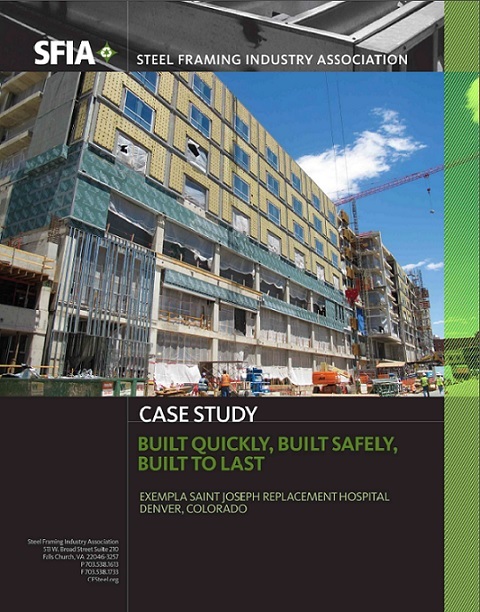 Exempla St Joseph's Hospital: Panelized cold-formed steel systems dramatically cuts construction times and sets a new standard in hospital construction. Courthouse Square, Condo Building Two : Hybrid cold-formed/structural steel system provides architect with creative freedom. 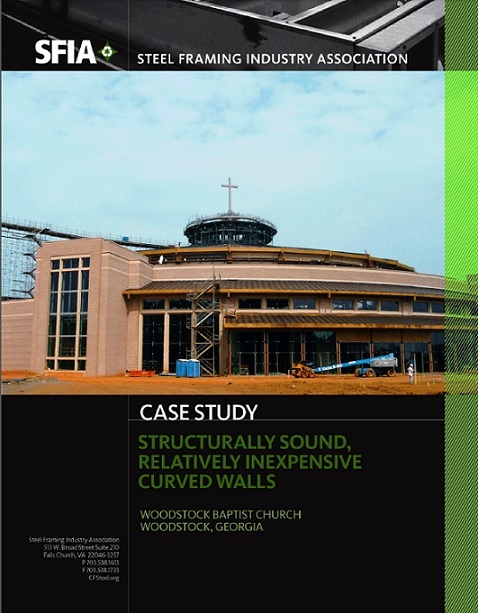 Woodstock Baptist Church: Strength, ductility, and light weight of cold-formed steel essential in controlling costs and meeting engineering requirements in unique church cupola.